Embracing all the advantages of stainless steel rope, this 13mm 6×36 stainless steel wire rope construction product has plenty to offer those in various industries. From marine lifting and maritime use to general construction deployment, it can fill a range of roles effectively. 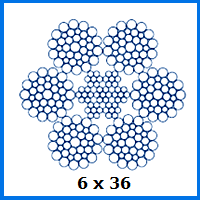 What are the specifications of 13mm 6×36 stainless steel wire rope? This wire rope is unlike some of our other products because it has a duo of potential core constructions to pick. The independent wire core is the stronger of the two, offering a capacity of 9,629kg and a breaking force of 94.5kN. The fibre core is more flexible, but has a lower 8,925kg WLL and an 87.6kN breaking force. This choice between cores is available for all of our 6×36 stainless steel rope range. Regardless of which wins you over, the rope will still resist corrosion and come with an attractive, polished finish. What other wire rope options are available? The first thing to point out is that Rope Services Direct is not limited to supplying wire rope, but can also provide customers with fibre rope of many kinds. In addition we stock fittings and other accessories that will be useful in a number of circumstances. Our tools, for example, can help you construct your own wire rope assemblies. Alternatively you can turn to our team and ask for a bespoke assembly to be built for you. Whenever you are in need of assistance, or want to place an order, contact us online or call 01384 78004 and talk to a team member today. 13mm 6x36 Stainless Steel Wire Rope Overall rating: 5 out of 5 based on 6 reviews.